Accurate zircon geochronology with good spatial resolution requires advanced microanalytical tools capable of dating small minerals within their petrographic context and/or domains in single crystals. Above, first U-Pb direct dating of iron oxide-copper-gold (IOCG) mineralization. Hydrothermal zircon crystals from IOCG-type ore deposits (Lyon Mountain, US). Data from P.M. Valley et al., Geology 37 (2009), p.223. 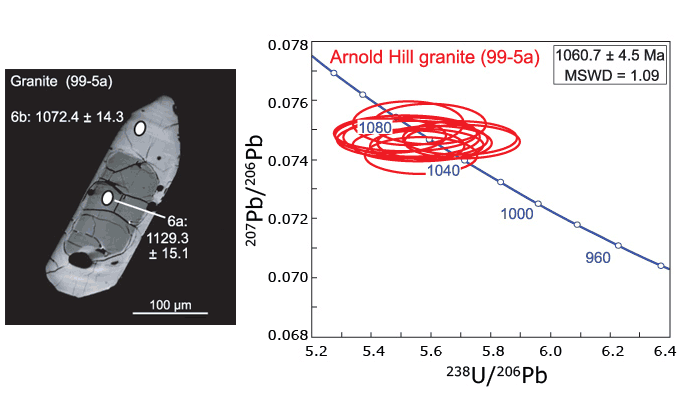 Young quarternary zircon is also routinely dated with CAMECA Large Geometry SIMS. Monazite, apatite, titanite, rutile and baddeleyite are also commonly dated and provide a wide spectrum of geochronological applications, all perfectly addressed by IMS 1300-HR³ and KLEORA Large Geometry SIMS. To learn more, download our application note: Advanced U-Th-Pb Geochronology with CAMECA Ultra High Sensitivity SIMS.